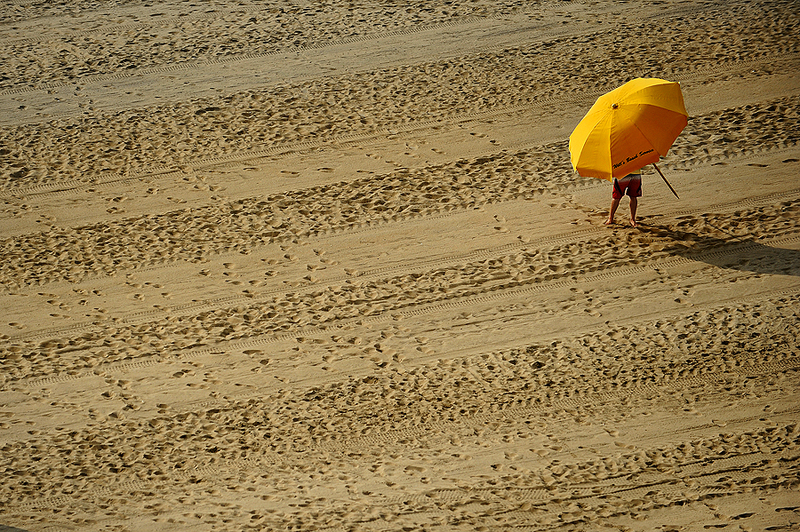 "A man sets up his umbrella early in the morning on 99th Street in Ocean City, Md., Saturday, June 25, 2011." Lucky me, I am headed back down Ocean City for a shoot this weekend. So I'll get to mix business and pleasure once again. I almost formatted this card, but remembered I made about 30 frames before heading back north to Baltimore during my last visit. And if you know me, you know I cannot pass up the cliche umbrella image, no matter what shape, color or size. Speaking of which, I am sure my shoot will include many more, so check back for the update on this weekend's shoot. "Boardwalk visitors stare at a pigeon near the inlet in Ocean City, Md., Friday, June 24, 2011." Found myself in Ocean City, Md., this weekend and managed to squeeze in an ongoing personal project entitled - Bored Walk. The small project and its name are very simple. The name is a pun, because the boardwalk is anything but boring. And the project documents the people who roam the boardwalk. It's more or less capturing the busyness of the three mile stretch. Normally when I am shooting on my own, especially when traveling, I stick to my graphic, clean way of seeing. But this project forces me to dirty up the frame so it matches the chaotic, yet subtle, people and mood the boardwalk evokes. As I said, this is ongoing, and probably will never be finished as long as I have a chance to visit Ocean City. I simply enjoy people and capturing raw moments and scenes in this small area, as things are never the same. I'll actually be back next weekend for a shoot, so I'll be trying to get up there again. With all that, I don't want to type too much because I think the pictures say what I cannot. "Wilson Ramos #3 of the Washington Nationals celebrates after hitting a three-run walk-off home run against the Seattle Mariners during the bottom of the ninth inning at Nationals Park on June 21, 2011 in Washington, DC. Washington Nationals won, 6-5." This is the epitome of sports - come from behind, last minute victory. The game last night between the Washington Nationals and the Seattle Mariners was a complete snoozefest. I continually looked at the back of camera throughout the game wondering what the hell would tell the story. Then the Nationals entered the ninth inning trailing by four runs. Seemed impossible. One out. Two outs. The game was over. But having played sports, you never give up. Sometimes things change, all it takes is one play. 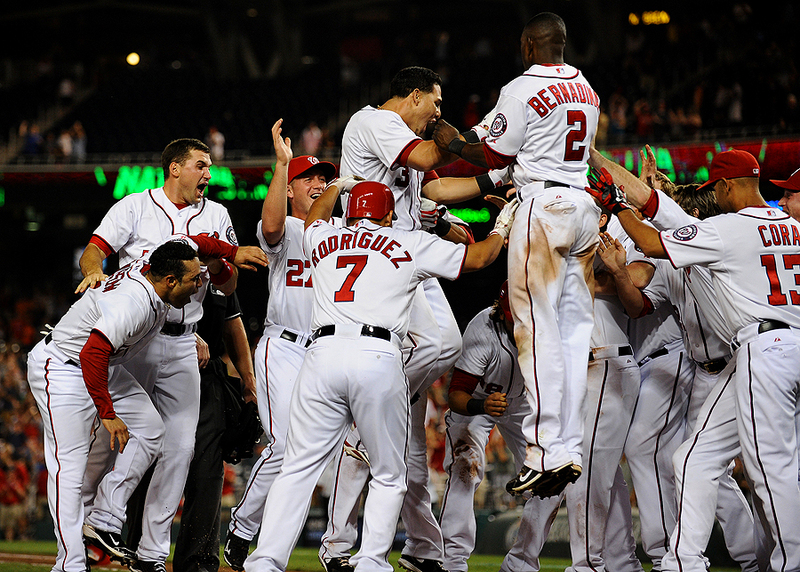 For being out hit at one point, 13-4, you still thought things were impossible for the Nationals. But all it took was a crack of the bat an instant roar from the crowd. Three-run walk-off home run bomb to win it. Walk it off it style and then get smothered by teammates at home plate, Ramos. Incredible ending to the game. Got to love sports. "Jayson Werth #28 of the Washington Nationals makes a catch against the Baltimore Orioles in the seventh inning at Nationals Park on June 19, 2011 in Washington, DC. The Baltimore Orioles won, 7-4." 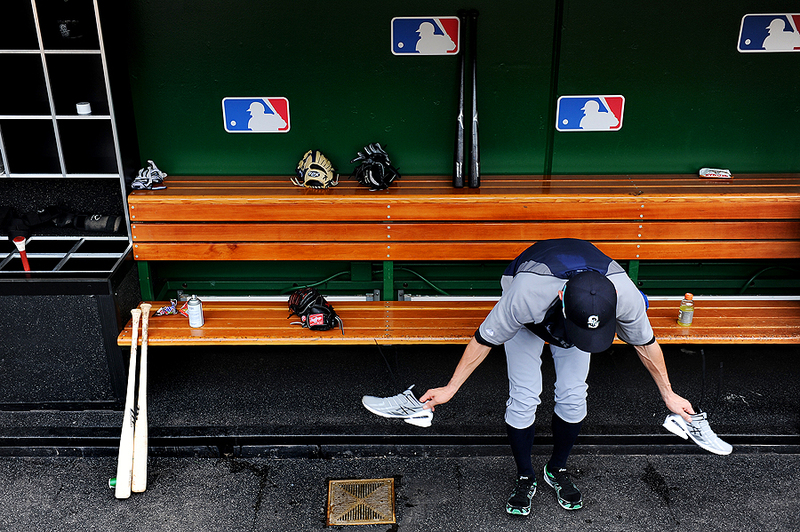 The first series is over, and I am heading back down today for a new series against the Seattle Mariners. While I was lucky to have two day games to start things off, the next two games are under the lights. While a bit anxious, I shouldn't be. I can't remember the last pro lighting venue I've shot under, as everything in Utah was high school or college lighting and poor. So things should be very nice. These first games were fun, but I was missing one key ingredient - music. I've learned to listen to my iPod during baseball games to make them go by a bit quicker. Yet I am terrified to do so during MLB games, as foul balls seem a bit more lethal. Oh, well. Still enjoying myself. So aside from my last two posts, here are some of favorites, which I had trouble editing down, from the Nationals Vs. Orioles series. 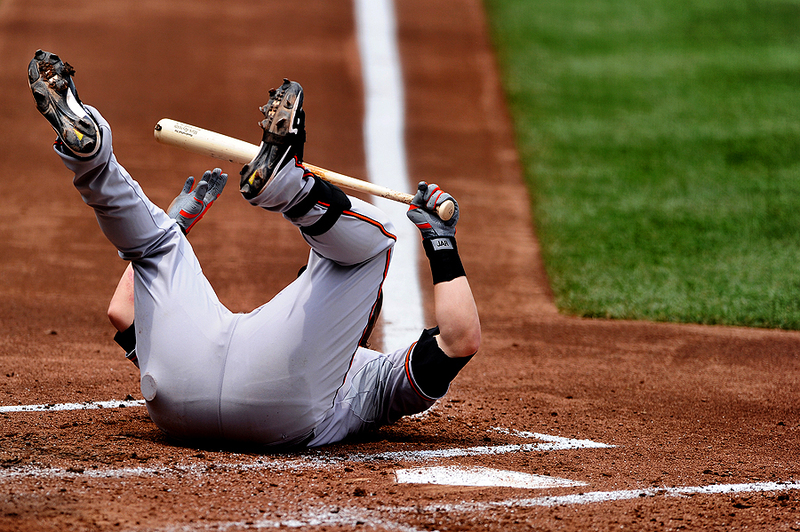 "Outfielder Roger Bernadina #2 of the Washington Nationals attempts to pull in a diving catch, but missed, against the Baltimore Orioles in the second inning at Nationals Park on June 19, 2011 in Washington, DC." Another day - another game at Nationals Park. Things seemed to flow a bit smoother on Sunday since I knew my way around the stadium. Action also seemed a bit more exciting, too. Within the first three innings, I had more action than I did during the game on Saturday. But that's how it goes in baseball. Some games are a total snooze fest, while others are much more action packed. Only difference was that the light wasn't as nice in my opinion. Although some beg to differ, as the overcast skies and sprinkles of rain delighted others. Was hoping the Nationals would keep their winning-streak alive. Alas, the Orioles came out on top, 7-4, ending any hope of setting a new winning streak. I have a break between the action, so hopefully getting some more pictures up in the meantime. "Mark Reynolds #12 of the Baltimore Orioles hits the dirt after an inside pitch against the Washington Nationals during the third inning at Nationals Park on June 18, 2011 in Washington, DC." I haven't shot any baseball since, well, I cannot remember when. I did a bunch of high school baseball in Utah last year, but that was last spring. 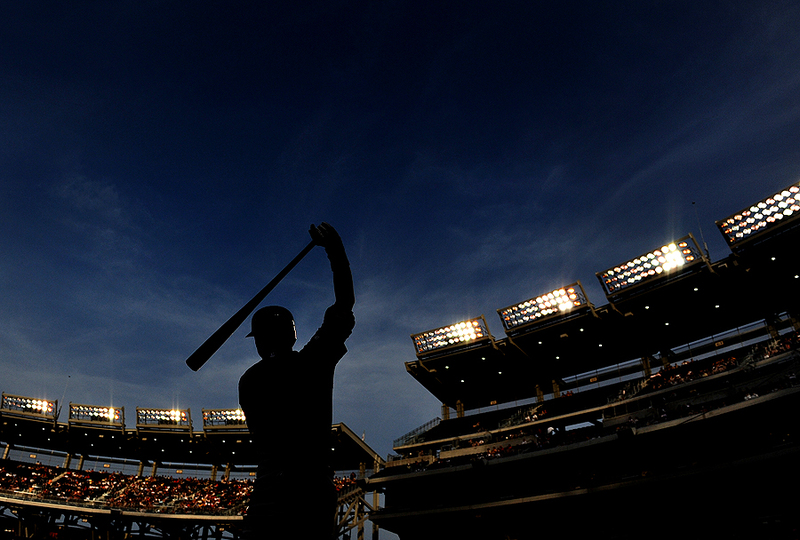 Getty Images assigned me to shoot a string of Major League Baseball games down at Nationals Park in Washington, DC - which began Saturday. I had shot a lot of Baltimore Orioles games before I moved to Utah, but never any Nationals games. So everything was new to me - new stadium, new area of town, new team, new players, and even my lens was new - as I recently upgraded from a 300mm f/2.8 to a 400mm f/2.8. But despite my anxiousness to shoot the game the night before, I feel like I did pretty good. It was like riding a bike - you never forget. I'll make a couple more posts in coming days as I cover more games, but wanted to get some sports action back up on this blog. "Lori Stephen lifts her son, Theo, from a small pool on a hot evening in Whiteford, Md., Saturday, June 11, 2011." This past weekend, I spent the day hanging out with K, her sister Lori, and her son, Theo. We roamed around downtown, drove in the car, went to the store, and ended up at their parent's home in Whiteford. By now Lori and everyone else in the family is used to my continual documentation of their lives when I am around. So snapping frames of Theo in the baby pool was simply normal them. I kept shooting tight photos of them, and everyone else, around the baby pool when I decided to move back for a few frames. Stepping away yielded this little gem which I think is a great moment. This is totally a type of feature I hoped and prayed to find on the daily feature hunt when in Utah. It's not often I give someone print, but I had to give Lori one of this the next day. She thanked me and maybe one day Theo will thank me, too. 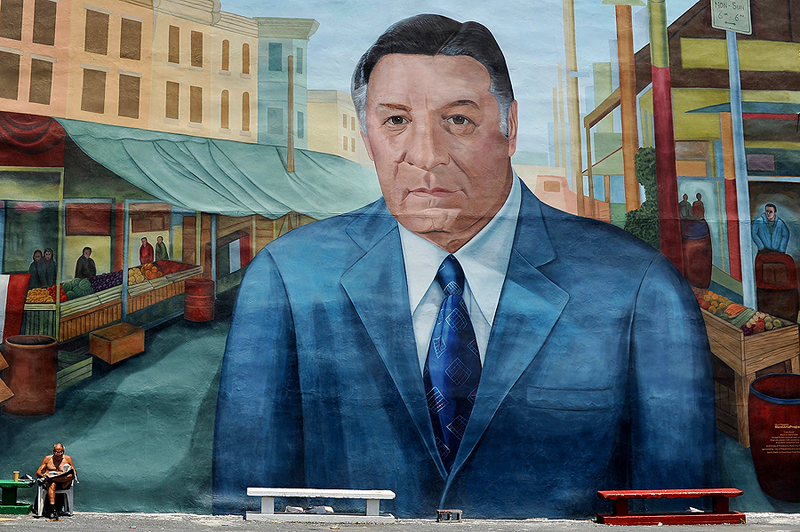 "A shirtless man reads a book in front of a mural on 9th Street in Philadelphia, PA, Monday, June 6, 2011." Was in Philadelphia earlier this week and made some snaps on the streets. Of course, I also had a cheese steak despite hearing that they're the old news in terms of food in the city. The word on the street is that pork provolone sandwiches are in. Maybe next time I'll get some more time on the street and indulge in a pork provolone sandwich.